Could Germany’s Co-Developed Urban Housing Be a Model for the Bay Area? Completed in 2013, Stadtquartier Friesenstraße is a mixed-use baugruppe project with 220 units in multiple residential buildings, six commercial buildings and 1.2 acres of open space on a 4.5 acre site. The development includes private balconies overlooking green space and several play areas. Image by Kristy Wang. Imagine you live in a dense urban setting, yet you can watch your children play in a shared garden while you work or do household chores. You live in a private home with enough individual living space for your family, but there’s also a large common living room you can reserve for birthday parties or neighbor gatherings. You had a hand in the design and creation of the building — in fact you and your friends came together to make the place. 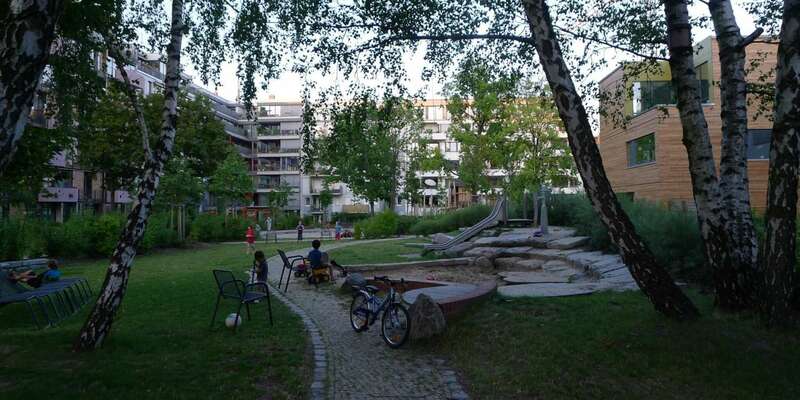 Germany’s baugruppen (“building groups”) are a modern form of co-housing in which households of all kinds collectively finance and build a multifamily building as a means to improve quality of life and foster community. Could it work here? SPUR is hosting a lunchtime panel conversation on October 5 with experts in co-housing and co-living to explore baugruppen and other models. Not to be confused with cooperatives or communes, Germany’s baugruppen reserve private living quarters for their inhabitants but also include shared spaces. Usually built new, they are developed by their future owners and can be personalized to fit the owners’ needs. Often groups of families or friends come together to create a baugruppe; sometimes interested folks are connected to each other by third parties. In contrast to most, though not all, American co-housing communities, baugruppen tend to be fairly high-density urban multifamily buildings. Baugruppen usually include a variety of unit types for families, couples, singles and seniors, often mixed in ways that the market might not deliver on its own. The units are usually compact but sufficiently sized and fully equipped to meet the needs of owners. The principal opportunity is a higher quality of life, but baugruppen can often be a more affordable housing option because developer overhead and profit aren’t factored into the financing model. In addition, these projects tend to avoid the homogeneity of buildings designed for the market, often combining a range of unit types to directly serve the households who plan to live in them. Common amenities, such as play areas, guest units, car sharing and gardens, are often prioritized, reflecting a communitarian sensibility. Since the first baugruppe was built in 1993 at Vauban in Freiburg, Germany, variations of this housing type have served as testing grounds for innovations in design, construction and energy efficiency, often because there are architects and designers involved from the outset. (This is atypical in the U.S., where less than 5 percent of homes are designed by architects.) Perhaps most remarkable is that local agencies have institutionalized solutions to the tricky legal, code and financing hurdles to co-development, so the model has been able to proliferate. In Berlin alone, more than 500 baugruppen projects have been developed. The Müggelhof baugruppe in the Friedrichshain neighborhood was formed by 25 women who wanted to live independently but within a larger community. Image by Kristy Wang. The opportunity to build so many of an unconventional housing type was due in part to the large number of vacant or underutilized sites in the center of Berlin after World War II. The city even designated some of those sites specifically for baugruppen and was often more likely to base these land grants on the quality of the housing concept rather than on the dollar amount of the offer. Today, however, many of those sites have been redeveloped, opportunities are shrinking and, as is happening in many large cities around the world, the value of land and urban housing continues to rise. Further, while baugruppen can be more affordable for a family in the long run, they aren’t typically accessible to low-income households due to higher up-front costs. The initial investment ranges from 20 to 30 percent of the purchase price, often more than the 20 percent typically required for a down payment. This is clearly a barrier to lower-income families who do not have those savings. What baugruppen can do is provide a vision for how cities might retain families, solve their own housing challenges and help to improve quality of life for those living in a dense urban setting. This is a model that could apply across the Bay Area, where future growth is primarily envisioned to be dense, multifamily infill development, but it bears particular relevance in San Francisco, where there is a movement to retain families of all income levels. However, Germany and the United States have very different housing policies, markets and cultural priorities. Planning and development are much more centralized in Germany. Germans and Americans have very different expectations about owning a single-family home with a yard. So how might we be able to support the development of a baugruppen-like housing type in the Bay Area? The process of forming a baugruppe and getting a project built is time-intensive and not without its challenges. While most baugruppen include 10 to 25 units, they are occasionally much larger. Sometimes baugruppen coalesce organically when friends band together, and sometimes they are formed with the assistance of state-sponsored organziations like STATTBAU, a consulting group that connects potential residents and architects to realize projects. STATTBAU also provides financial advice and conducts tours, workshops and presentations on baugruppen and other co-housing opportunities. The organization has advised 250 groups, providing technical assistance, a “kit of parts,” standard contracts and other advice on how to realize co-housing projects. A similar organization, whether housed within government or in a nonprofit, would be necessary in the United States to help would-be baugruppers navigate the process of planning, design, land purchase, construction and management. City support would also be key to implementing baugruppen at scale. Berlin has dedicated government staff working on baugruppen, as well as an agency designed to assist people interested in co-housing projects; Hamburg and Munich even have a quota for co-housing. While an individual project might succeed at making its way through the Bay Area’s arduous approvals and construction process, scaling a model like this would require assistance. Financing might be the largest hurdle for baugruppen in the United States. In Germany, many banks understand and finance baugruppen, but pioneers had to self-finance their projects first. Traditional banks in the U.S. balk even at seemingly uncontroversial financial products like tenant-in-common loans and aren’t currently set up to finance atypical projects. Local banks or credit unions might be the most likely financiers to help normalize underwriting for projects like baugruppen, where buyers would need to be able to pool their mortgages into order to access funding for construction. Creating a system to support baugruppen might seem daunting, but in Germany it has been a worthwhile investment. Thousands of people in Berlin alone have a higher quality of life in an urban setting because they live in these types of homes. Baugruppen could provide a compelling vision for young urban Bay Area families that might not have thought they would raise their children in a multifamily home. The baugruppen concept is no silver bullet for the Bay Area, but it’s a housing type that could provide an opportunity to diversify the kinds of buildings being built and meet the needs of families in cities. Thanks to Constance Cremer and Maximilian Vollmer at STATTBAU and to Mike Eliason.